Patterson Scholars at Appalachian State University are Troy Colvard, front row left, Samantha Couch, Anna Carpenter, Brianna Ramirez and Catherin Utley. Pictured on the second row are Brandy Booe, left Sarah Teumer, Marissa Minnick, Savannah Kulenic. Scholars on the last row are Nicole Iorio, left, Olivia Thompson, Nicole Hoffman, Nicholas Flippen, Samantha Adams and Hannah Robinson. 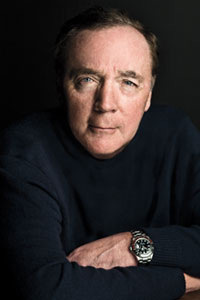 Each student has received a $7,500 scholarship funded by best-selling author James Patterson to attend Appalachian. Sixteen education majors at Appalachian State University might consider author James Patterson their guardian angel. Patterson, author of the best-selling Alex Cross and Women's Murder Club novels, first funded scholarships in the university's Reich College of Education in June 2012. Eight freshmen were each awarded a $7,500 Patterson Scholarship for 2012-13. This year, eight more freshmen received the author's scholarship, funded through the Patterson Family Foundation. The Patterson Scholarship covers tuition and related expenses. It is awarded based on financial need and the potential to become leaders in education. For the students, it has turned a dream of going to college into reality. Although her parents always encouraged her to follow her dreams, she was worried about how she would pay for college. “I cannot express how relieved and honored I felt when I was awarded the Patterson Scholarship,” said Iorio, who acknowledges that receiving the scholarship relieved her from significant stress. David Jackson: Today we have Nicole Iorio with us. She is a junior Middle Grades Education major, a James Patterson Scholar and one of the warmest folks right now in the College of Education being inside of this building. Nicole, welcome to The Rock. One of the things that immediately jumped out when I read your bio was middle school. Those middle grades are so formative for a lot of kids. What made you choose middle grades education as your major? Nicole Iorio: So when I started Appalachian I came in as a Secondary History major. As I went through the classes I realized I kept picturing myself in front of a middle school class even though that would not be my degree when I graduated. After talking with a lot of adults I respect, I realized I have way too weird a personality to be in front of high schoolers and I really enjoy that middle school age because it makes or breaks students. It makes them feel like they either like school or they hate school. And I want to encourage them to like school as they go on into high school. DJ: Well, that is fantastic. That’s a great reason to choose that direction. What made you choose Appalachian State? NI: It’s kind of a weird story. I was going to Meredith College in Raleigh because they offered me a full ride and it was close to home. Then, I told my parents as soon as I was accepted to Appalachian, “I know I haven’t toured App and I haven’t been to any of the Freshman Preview Days but I have to go there. I don’t know why. I just have to go there.” I accepted against my parents’ wishes because it’s so far away. I ended up coming and it’s everything I ever wanted it to be. It’s such an incredible place and I’m so happy I’m here. Why wouldn’t you choose Appalachian? It’s such a family. DJ: You know…You talk about that family. That family really extends especially to educators that go out into the schools especially here in North Carolina where so many of them find their work these days. I’m sure many are like me and like you as well…you had that Appalachian teacher that was in your background at some point in time that starts gently tugging on the strings to send you up to Boone. What have you realized…the value of that network especially now that you’re moving up in your major getting ready for student teaching? To be able to rely on people that have walked in your shoes up here but also understand what you’re about to get into. NI: It’s really such an honor to say that I am an education major at Appalachian State University. A couple of weeks ago I was wearing an App State shirt and I was buying a car. I was sitting in the dealer waiting to sign all the papers and this man walks out and he goes, “Do you go to Appalachian?” I said, “Yes I do.” He said, “Are you an education major?” I said, “Yes I am.” He said, “You come find me. I will have a job for you. I’m a principal at a nearby middle school.” It’s just that sense of community where you can walk anywhere and everyone knows what Appalachian is and everyone knows what education is and to say that I’m an App State educator is just incredible. DJ: I’m gonna start buying more cars! Apparently that’s the key to it all. Now you’re part of the Appalachian Educators. Tell us what that’s all about. NI: Appalachian Educators is an education club on campus that really includes any education major who wants to be a part of a community and feel like they have that backbone structure of you know professional development is so important when you go to college and then going out into job interviews to say that, “This is what I’ve done in my four years at Appalachian. Yes I have this degree but that does it mean to you?” So, at Appalachian Educators we can show them resources to use. You know, lesson plans, it’s a great way to make friends and it’s really important. It’s been a very important part of my life here at Appalachian. DJ: You know you hear so much about education in the media and not all times is that positive. You hear about budget cuts and things like that. Yet, I hear the way you speak about what you’re getting into with your career and I can tell you’re very passionate about that. To be that way about education right now…it unfortunately seems a bit odd based on what you hear but do you feel that is really kind of the way that people…that your classmates and other folks that you interact with in your major really feel like they can make that impact that you’re talking about? NI: Absolutely! I feel like we all come from the same standpoint in that we don’t really have a choice. When you want to be a teacher, it’s like something you’re born with, like brown hair or blue eyes. You just wake up and you know you have to be a teacher. You know you have to inspire children and so when people say, “Why do you want to be a teacher?” it’s like, “Well, why do you want to do what you want to do? I have to do what I have to do because it’s what I was made to do.” So, I know that I am whole-heartedly in the right position…in the right profession and I know it’s not going to be a job when I graduate, it’s just going to be a lifestyle for me. DJ: Well, Nicole Iorio coming to a middle school near you! You’re a tremendous ambassador for Appalachian State University. Best of luck in the rest of your studies and stay as warm as you possibly can here today. NI: Thank you so much. DJ: All right! Education day here at The Rock. We’re glad once again to partner with the Reich College of Education. Hopefully the educators and educatees that are here today will help put the Mountaineers over the top against the panthers of Georgia State. Nicole Hoffman of Gastonia, now a sophomore, was one of the first to be named a Patterson Scholar. She plans to become a high school English teacher. Her own high school English teacher inspired her to enter the profession. During an internship requirement for her senior project, Hoffman was able to create a 90-minute lesson plan and taught Mary Shelley's "Frankenstein" during a class period. "I just really fell in love with being in front of people and really helping them," she said. Hoffman also had helped nieces and her peers with their homework. The scholarship, plus other awards she has received, means Hoffman has incurred only minimum debt for her first two years of college. "You have no idea how good that makes me feel," she said of Patterson's support. 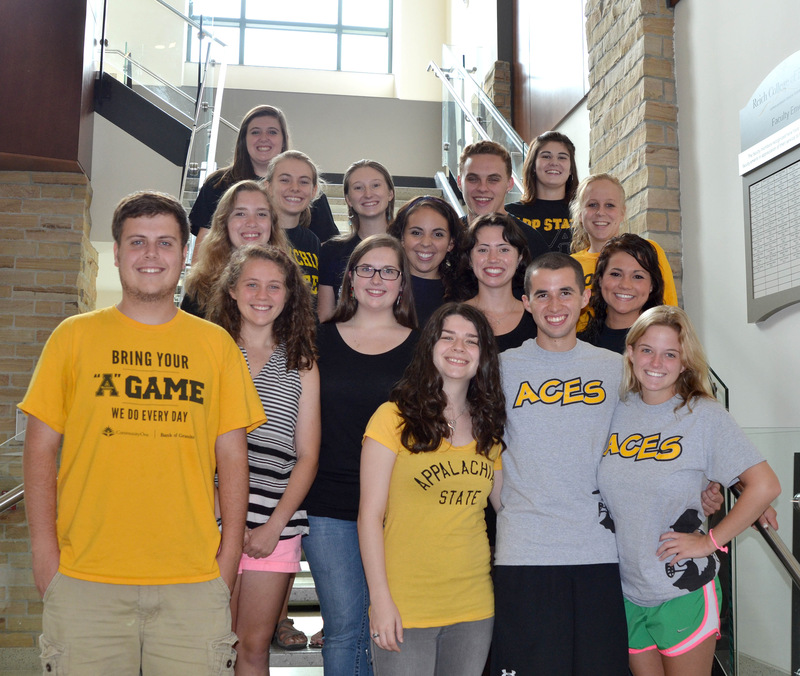 Hoffman is a member of ACES - the Appalachian Community of Education Scholars, which has replaced the no-longer-funded N.C. Teaching Fellows Program. "That gives me a community of people who have the same passion as I do," she said. Troy Colvard of West Jefferson loves history and wants to share that passion with others as a high school history teacher. He also was inspired in his choice of profession by his teachers in high school. "I really love history and see it as an interesting story, not just facts," he said. He had the opportunity to study some of history's darker stories this summer during a study abroad trip to Europe that focused on the Holocaust. Having received the Patterson Scholarship for two years means Colvard won't be weighted down with loans to pay back after he graduates. "This definitely is helping me and I'm super thankful for it," he said of the scholarship. "It's encouraging to see that someone still cares about education." Colvard shares his passion for teaching with students in the local elementary schools. "Mr. Patterson is very focused on literacy, so we try to focus a lot of our activities on literacy," Colvard said. Last year, he and other Patterson Scholars visited a local elementary school each week and made a book based on the stories the students and family members told about their community. "It's such a close-knit school," he said. This year, the Patterson Scholars will collaborate with the Reich College of Education's Kaleidoscope outreach program to integrate reading with drama exercises for area elementary students. Colvard also is a member of ACES. "Being with other education majors who share the same passion that you do, especially in this day and age when it seems the whole world asks why you want to be a teacher, is invaluable," Colvard said. Sophomore elementary education major Samantha Couch of Yadkin County said having the opportunity to be an influence on others has drawn her to the teaching profession. "I don't think that teachers realize exactly how much an impact they are making on the children. That's why I want to teach, because I had such a great teacher who inspired me," she said. Couch said teachers not only impart academic lessons but life lessons as well. "Teaching (others) is the best gift you could give anyone," she said. Without the Patterson Scholarship, Couch said it almost would have been impossible for her to attend Appalachian. "He is my grandmother's favorite author," Couch said of Patterson. "She was almost more excited (about the scholarship) than I was." Couch and her little sister have been raised by their grandmother. "She always said that if I made the grades and got in, I could go to college. It would be a struggle, but I could go," Couch said. "This scholarship has made it possible for me to attend Appalachian, because I never would have added the pressure of her trying to provide for my education. On a single family income, it would have been near to impossible." Couch said awards such as the Patterson Scholarship let others know the importance of earning good grades in school, which can lead to the opportunity to go to college. "I'm so blessed to be given this opportunity," she said. One of the newest Patterson Scholars is Savannah Kulenic of Wilmington. Kulenic said she was speechless and even cried when she learned she had received the Patterson Scholarship. She was babysitting when she received the good news, and her young charges decided to bake a cake to celebrate. Kulenic has lived with her aunt and uncle since she was in third grade. "Taking on a child was definitely a big step for them. I didn't want them to have the pressure of making sure that I succeeded in college," she said. "I wanted to be able do it on my own. So this scholarship has really helped." Kulenic has known she wanted to teach since she was in preschool. Her goal is to be a middle grades language arts teacher. It's probably no coincidence that her aunt is a fifth grade teacher. "School has been my safe haven," Kulenic said. "I was really attached to every one of my teachers and I can tell you every one of their names. Each one of them has had a positive influence on my life and I want to be able to do that for someone else." Helping her aunt grade homework and brainstorm ways to ensure students could grasp concepts gave Kulenic further insight into the work of a teacher. "I can't picture not teaching," she said. "I hate the pay, but I don't know what else would fit me." Freshman Judson MacDonald of Cary is another Patterson Scholarship recipient who is bound to change his students' lives. He plans to major in Spanish education. He also has wanted to be a teacher since he was little. "I remember in kindergarten when we had career day and I told my mom I wanted to dress up as a teacher," he said. The future educator borrowed his father's briefcase and donned a button-down shirt and glasses. "Going through school, I started watching my teachers and compiled notes on different teaching methods that really worked for me," he said. "Appalachian just felt like home when I came here," MacDonald said. "It was the perfect fit. I felt like I was somewhere where I belonged. Everyone was very welcoming." MacDonald is paying for his entire education because he doesn't want his parents to have that financial burden, even though they could contribute to his education. He applied for scholarships and saved almost all his paychecks from his summer jobs. "Receiving the Patterson Scholarship was amazing. It took such a load off me," he said. The cost of his entire freshman year has been covered by scholarships. The second scholarship was a memorial scholarship established in honor of a Wake County teacher. MacDonald said of Patterson, "He is inspiring students to get into education and find their passion whether it's math, Spanish or another academic area." MacDonald's goal is to return to the Wake County area when he graduates. "I would love to be a high school Spanish teacher," he said. "With so many cuts in North Carolina education right now, I am a little concerned for my future, but I know I will find something."